One of my resolutions for 2017 was to host more get togethers in my home. I've always been a fan of hosting and party planning especially with close friends! Although my apartment is on the smaller side, I really enjoy transforming my cozy space into a stylized party space. For Christmas I received a Cusinart Electronic Fondue Set from Crate and Barrel. I'm a sucker for fondue and the various recipes you can make using a single fondue pot. In particular, I'm a huge fan of cheese fondue for appetizers and chocolate fondue for dessert. This month, I'll be hosting some friends over at my home for an afternoon cheese fondue party. Once I landed on what sort of fondue I'd be serving, it was time to party plan! Along with party planning came a fondue trial run (a must in my book when throwing a foodie party). I've decided to share in this blog post my fondue trial run, my need to have's and need to know's when hosting a fondue party. I'll be doing a follow up blog post once I host the actual event. - A Fondue Set/Pot: I recommend the Cusinart Fondue set I listed above as it's a great price and is easy for setup, serving and clean-up! It's also handy because it comes with 8 Stainless Steel Fondue Forks. - A recipe and ingredients: It's all about personal preference. I scoured Pinterest for a fairly generic cheese fondue recipe and landed on The Melting Pot Cheese Fondue Recipe. I figured most people would like it. On my own time or if I had more than one fondue pot, I'd try some more adventurous recipes. For a trial run, get all the ingredients you need so you can try out your recipe in full. Also be sure to calculate how much you'll need for the amount of people you are hosting as well as making sure you have plenty of dippers (bread, apple slices, salami, etc.) for everyone. - Napkins, plates, utensils: As a designer, I love when my parties have a consistent look and feel to them. When I discovered Harlow & Grey's modern party goods, I was swooning. 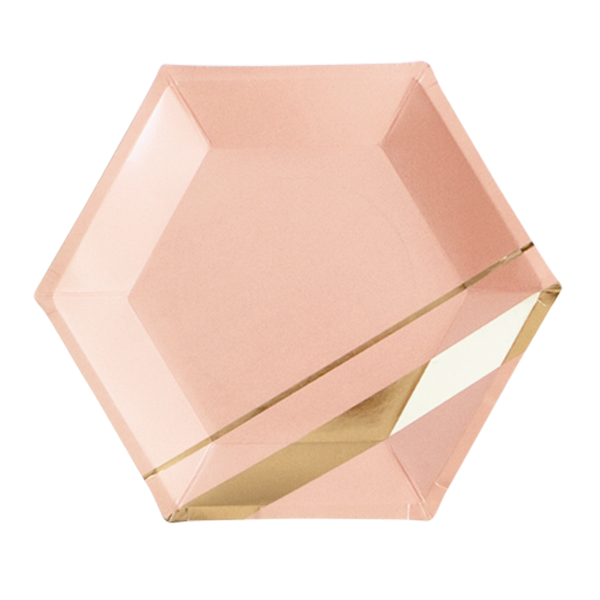 I stocked up on Marble Hexagon Small Party Plates and Large Blush Hexagon Party Plates. I tend to find paper plates the key to success for parties like this because you can dispose of them after use rather than having to load up a dishwasher. I also couldn't resist the Splash Cocktail Napkins. Utensils are key for a fondue party, make sure you have enough stainless steel fondue forks for everyone! I prefer fondue forks with colored labels on the ends so everyone can keep track of their designated fork. Forks and knives are also helpful for guests that want to eat off their plate after scooping up the fondue. - Pairing options: Wine and cheese are always a win in my book. It's always a good idea to provide your guests with something that pairs nicely with the dish/food you are serving. I plan on serving white and red wine options as well as beer and sparkling water for guests attending, all of which pair nicely with cheese. - Serveware: Make sure you have enough serveware for your guests to collect their dippers for the fondue! Knowing I was throwing a fondue party provided me with the opportunity to splurge on a serving tray I'd been eyeing at Target. My best friend Lauren who came over for my trial run also let me borrow her Marshall's wood/marble serving tray too. 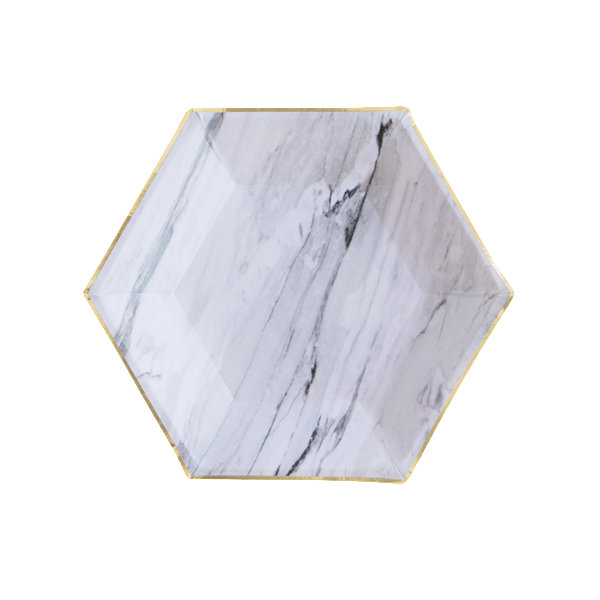 It's true, I can't get enough of marble. - How many guests are coming: this will help you determine the amount of food and beverages you'll need to serve. - Timing: I'd recommend prepping the fondue either right before guests arrive or as they are arriving. This ensures even with the fondue pot still on throughout the party, the fondue tastes fresh and warm. - Eliminate the stress of hosting and have fun with it: Hosting should be fun. If it's not, figure out what stresses you out about the process? Do you like co-hosting? Maybe it's a better idea to host alongside a friend. Does cooking/prepping food stress you out? At a fondue party, ask guests to bring over a favorite dipper for the fondue or a beverage of choice. Is it budget? Make a budget BEFORE you start buying supplies, ingredients and decor. Stick to your budget, determine if you can get crafty at home and what items you'll need to splurge on.